The Harvard Depository is a massive storage facility that houses more than half of the University's 17 million-volume collection (photo 1). Patrick O’Brien (photo 2), systems and special projects manager, is a member of the team that oversees the operation, which includes numerous phases of preparation (photo 3). “I still walk in here and say, ‘Wow,’ ” said Steve Bertino. Bertino is part of the team that runs the Harvard Depository, a high-density, high-security, off-campus facility that houses a staggering amount of materials from Harvard’s library collections — representing much of human knowledge accrued since the dawn of civilization. 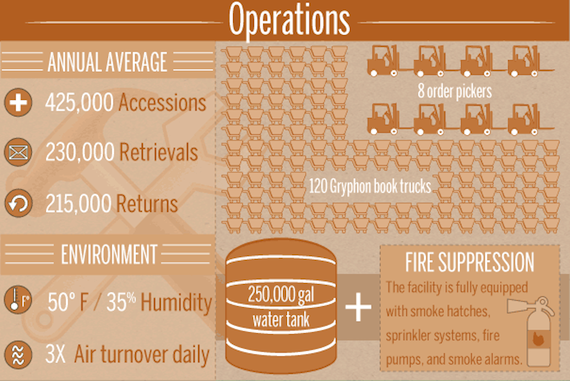 This is patron service and stewardship at a massive yet precise scale. The depository holds about 10 million volumes on 30-foot-tall shelves, and industrial lifts are used to retrieve items for patrons. 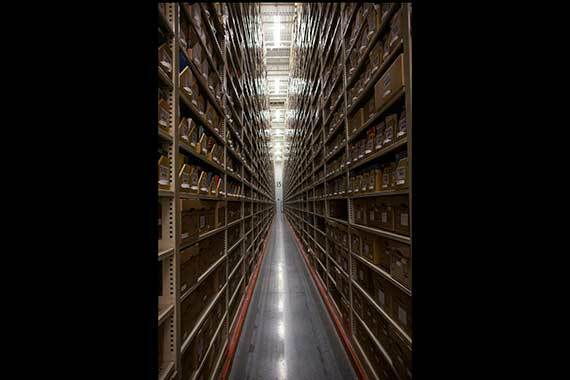 Each lift travels only about 200 feet, yet passes 400,000 books on 2,000 shelves per aisle. About 880,000 manuscripts, films, maps, University archives, and photographs, as well as books, flow through the facility a year, about the number of breaths the average adult takes in the same time period. 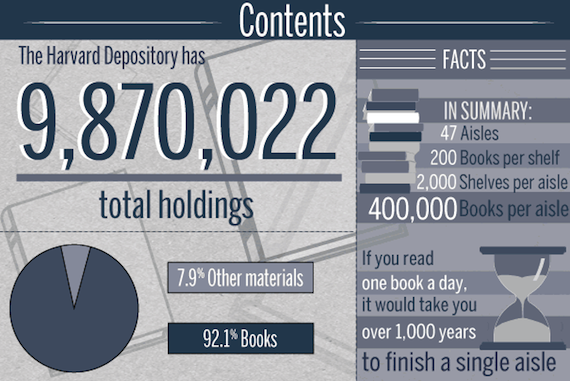 Click here for a full rendering of the Harvard Depository infographic. Comfortable for books is 50 degrees Fahrenheit, a little warmer than the household refrigerator, and low relative humidity. Conditions are optimized to the media; films are kept even colder, at 40 degrees. These conditions are maintained constantly with a deviation of no more 3 degrees. Space, energy, and time are maximized; standardization makes the system work. Items are categorized not by subject matter or Library of Congress call number but by type, owner, and size. Like goes with like. Books are quickly sized by hand and grouped with similarly sized volumes. They are then lined up in cascading order in a specially made, acid-free cardboard tray, creating a neat incline. The trays are placed on shelves that accommodate the volumes exactly, leaving a tiny margin for moving them in and out of the shelving. The trays are barcoded and color-coded as if readied for an expert game of Tetris. A batch of items is always scanned, then rescanned before shelving. Redundancy ensures that nothing is lost. Staffers run a report after each batch to compare; any inconsistencies are flagged and resolved before the trays are lined up on carts for shelving. The Harvard Depository was built in 1986 to balance the burgeoning need for space on campus with the growing collections of Harvard’s library. 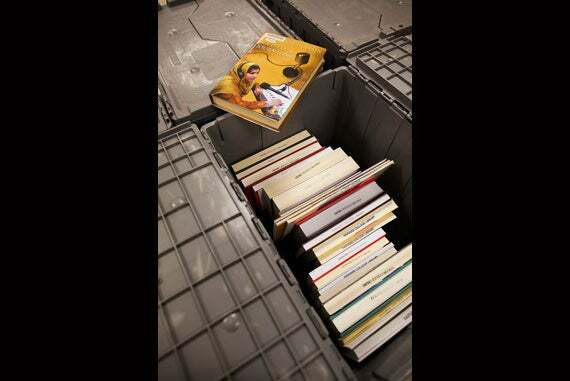 A tote of incoming books waits to be processed. 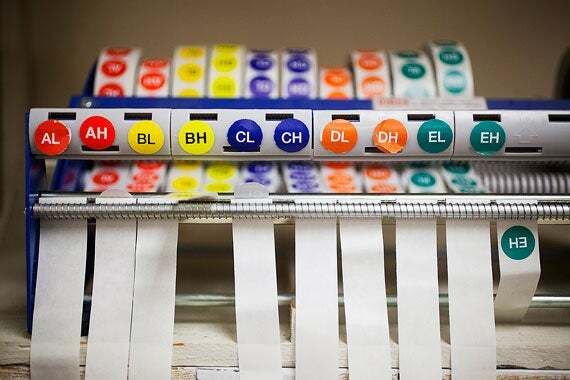 Myriad coding systems including color coding are used to indicate a book’s location by module, aisle, ladder, shelf, and finally by tray. Pickers use neon yellow harnesses to secure themselves to the lifts, which extend to the tops of the shelves, over five times the height of the average American man. “A lot of us aren’t afraid of falling, but we don’t ever have to worry about that, it’s completely safe,” said Keith Lyseth, an operations specialist. A journey down a single aisle on the lift — the same kind used at Home Depot — is only 200 feet, yet travels past 400,000 books on 2,000 shelves. Since browsing is not a function to be taken into consideration, typical library classification systems are unsuitable here, and books are visually sized with a sorting aid before being stored with similarly sized items. The building is composed of nine modules, long and narrow concrete structures; apart from the shelving, the only other significant component in the hangar-like space is the ductwork and fire-detection and suppression pipes wires that run up, down, and across the walls, shelving, and ceilings to maintain and protect the preservation-friendly environment. “One of the best things is seeing the amazing requests for a variety of items from the sciences, humanities, languages we don’t know, languages we do know. 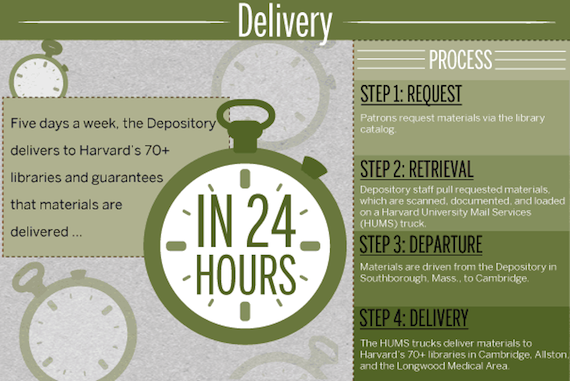 Getting these orders to patrons quickly is very cool,” said April Duclos, who manages Scan & Deliver, a free electronic delivery service run from the depository. Security needs to account for all contingencies to prevent a loss that could come from putting all 10 million proverbial eggs in one basket. There are backups to backups, and plans for emergencies of all kinds, even a natural catastrophe. Six miles of pipe crisscross the facility as part of its fire-detection and -suppression system, which is monitored constantly, and equipment for leaks is placed liberally around each module. The depository also serves another function at Harvard: educating students. 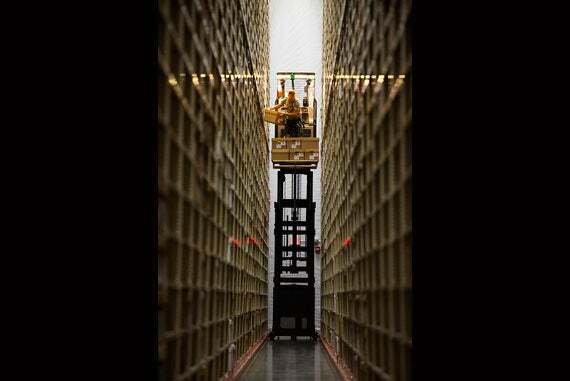 Professor Jeffrey Schnapp of the Harvard Graduate School of Design (GSD) recently led a two-semester course, “Cold Storage,” that used the depository to explore the cultural and technical dimensions of libraries, depositories, and storage facilities, resulting in student-produced experimental documentaries. The films bring the intricacies and scale of the depository online, recording the constant beep of scanners and the mechanical whirr of the lifts over sweeping views of the stacks. 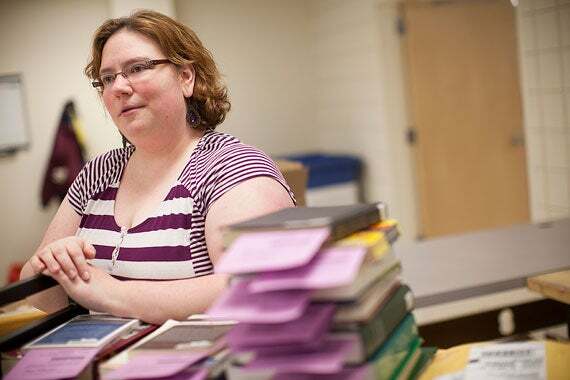 “It blew my mind when they were going to get a book and they had a list that listed the aisle number, the ladder number, the shelf number, and the tray number, and it made me think about all that goes into that,” said Peter Kirschmann, a Graduate School of Education (HGSE) alumnus who took the course. Marshall Ford, a second-year student at the GSD, was attracted to the course’s hands-on approach. He knew almost nothing about the facility and recalls his first visit vividly. 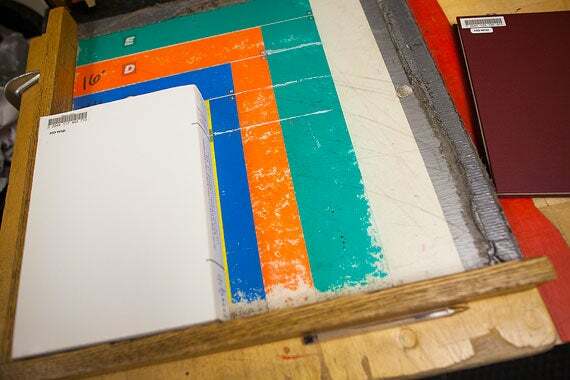 The Harvard Library will hold the Symposium on Sustainable Models for Print Storage in 21st-Century Libraries on Wednesday and Thursday to explore possibilities for managing research collections now and in the future. Harvard College student Matthew DeShaw participated in the 10th annual Harvard Yard dig (photo 1), alongside Jeffrey Zhao '16 and Matthew C. Gschwend '16 (photo 2), which DeShaw said turned up "a few pieces of coal, aggregates of rock, shards of glass, and an MBTA token" (photo 3).